MeasureMatch is an on-demand professional services marketplace ecosystem. Our end-to-end platform enables direct, seamless and flexible access to a global, liquid workforce of amazing independent systems engineers and data management, data engineering, and data science pros to get important marketing, commerce and customer experience (CX) project work done fast. It’s ok to comparatively think of Uber or Airbnb or Helpling or TaskRabbit, we support the matching of supply with demand similarly, all the way through to contract management, payment processing, ratings, and feedback. But that’s where the comparison ends. I invited James Sandoval MeasureMatch, Founder & CEO onto my tech podcast to share his inspirational story. He describes himself as the product of an unlikely union during the height of social unrest in 1968 France. It was, according to Mark Kurlansky, “The Year that Rocked the World”. His mother, a beautiful, vibrant young woman from the Lorraine in the east. His father, on his first assignment abroad as a freshly minted US Air Force airman. They lived and loved. And, together, we created homes in six countries over the following ten years, moved another four times during the next ten, averaging around 2 years per location. This nomadic life, no doubt, influenced the shaping of his professional journey i.e. roughly 2 years per organization until he went rogue and set up his first company in London in the summer of 2008 – right when the financial crisis swelled into a global nightmare. We talk about his story and also learn more about the mission at MeasureMatch to forever change the way businesses access and benefit from data, analytics & technology professional services and talent. On demand. 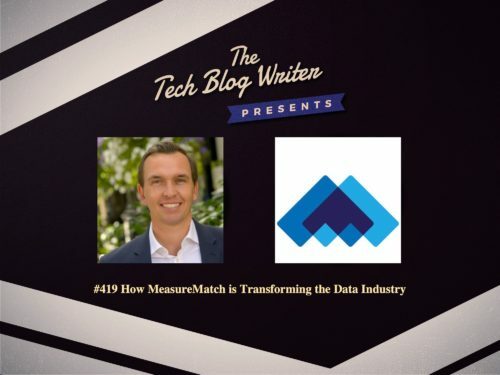 We also learn how MeasureMatch is taking a big bite of a $30+ billion market of technology & data professional services, starting with a focus on addressing marketing, commerce and customer experience-related business needs. MeasureMatch is helping every organization to be more successful in a digital world.